A particular speciality of Mexican style is that it brings together elements from indoors and outdoors to create a wonderfully casual yet sophisticated feel of rustic ambience to any living space. Outdoor garden pottery can come in many shapes and forms, from genuine region-specific specialty artworks to commercial pieces. All have a special vibrancy in their finish that contrasts sharply with nature, whilst echoing garden themes through the shape. Here are some suggestions for outdoor pottery that will add a little Mexican accent to any garden. Because most Mexican pottery is hand crafted, pots can come in any shape or size. Generally, however, most pots will be a gourd-type shape, with a bulbous body and a short, narrow neck, or a classic honey pot shape with a rope around the lip. 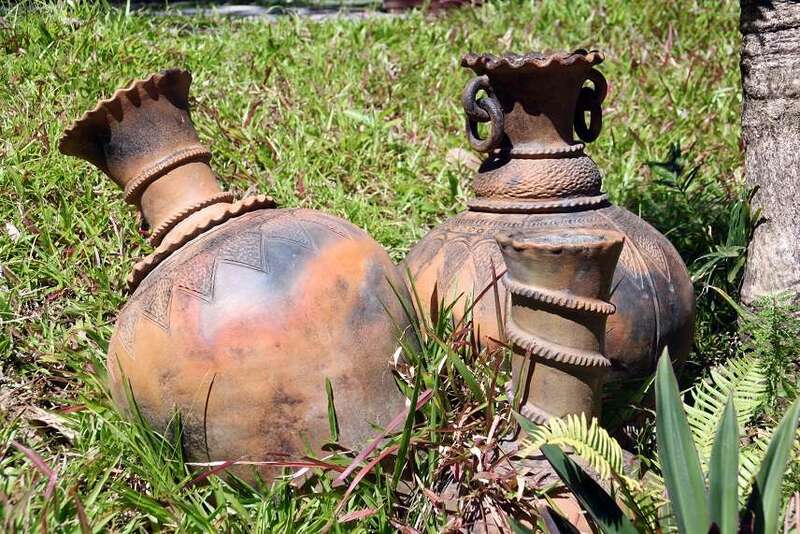 Many will also feature handles around the neck, making it look like a water jug. Finishes vary vastly, from specialised burnished polish with detailed etching, to commercially manufactured glaze. Many, however, will either be left to simply radiate as a smooth burnished or glazed finish, or else be painted brightly with garden themes such as flowers and cacti. Some specialised styles, such as the Talavera style, will also feature intricate geometric patterns of flowers and leaves. Other styles also include sculpted relief patterns in the otherwise unglazed and unburnished surface. Pots can also include half-pots that are hung on the wall, to create levels of garden where garden may otherwise not be possible. There is nothing like being able to entertain outdoors as often as possible, and what better way to keep the outdoors warmer than a chiminea or a fire pit? A chiminea looks like a pot at first glance, with its tall neck and bulbous body, but it clearly has an opening in the side to stoke a fire. It is a uniquely Mexican outdoor feature. Fire pits are often shaped more like a large dish. Both often come with a wrought iron pedestal or stand, which matches perfectly with the wrought iron detail of many styles of Mexican furniture. In recent times, pottery makers have branched out to include ornaments and wall hangings as part of their selection. These are often brightly painted to contrast with the natural colors of the garden. Themes often revolve around nature, particularly the sun and small animals such as lizards and frogs that may be prevalent in a domestic garden setting. Some ornaments double as small pots for plants such as cacti.